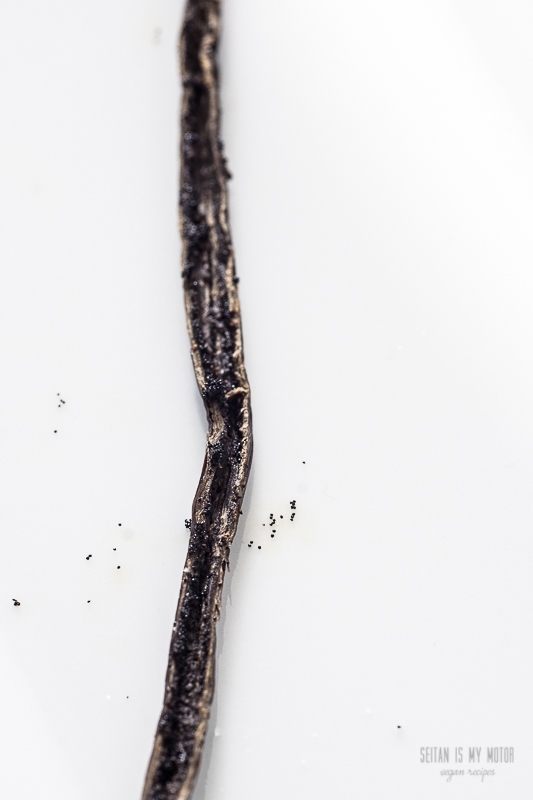 I recently read about a Cook’s Illustrated test on vanilla extract. 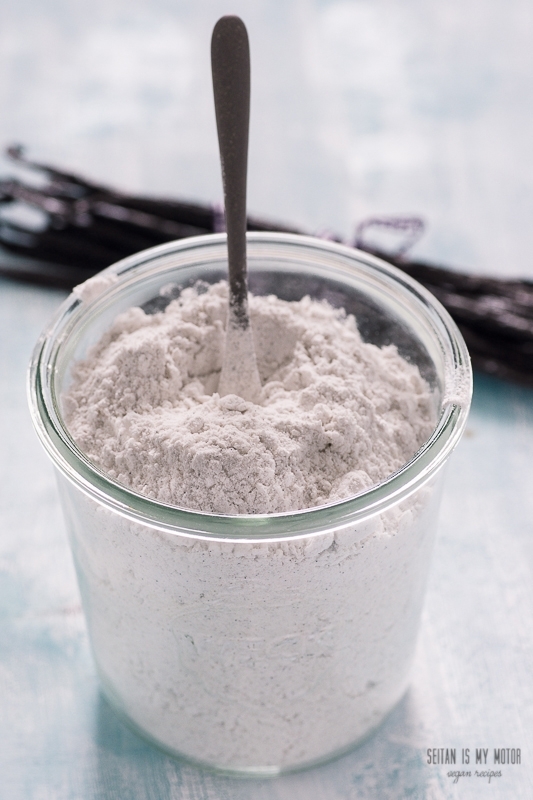 When used in baking it doesn’t seem to make a difference whether you use real vanilla extract or imitation vanilla. Which surprised the testers. But should it? I don’t think so. 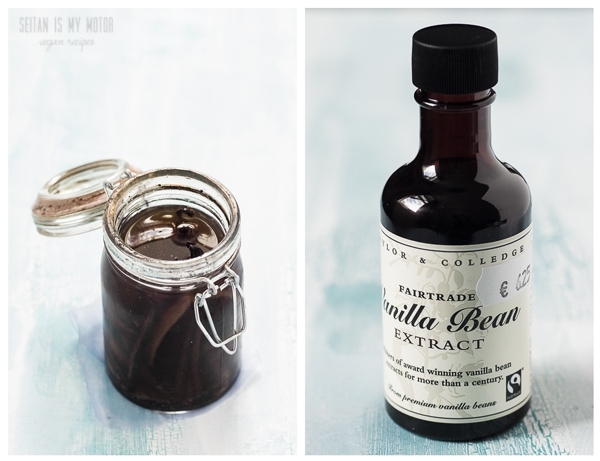 I only started using vanilla extract after buying my first US-cookbooks a couple of years ago. Because in Germany we don’t use vanilla extract. We use vanilla sugar. (Which is not necessarily better, but I’ll get back to that later.) At first I had no access to pure vanilla extract. So I made my own using tons of vanilla beans and a few fluid ounces of vodka. I placed the mixture in the fridge and let it sit there for a couple of months. When I finally started using it I was a bit underwhelmed. The taste of my vanilla extract was very different from the vanilla sugar I was used to. The alcohol brought out the smoky, tobacco-like flavour that I can taste in vanilla pods very well. But also there was a lot of alcohol in that extract. It was very sharp and concentrated, while vanilla sugar is much milder and much more subtle overall. Sure, you’re not supposed to taste vanilla extract straight from the jar. And yes, I know that the alcohol cannot be tasted once you’ve baked your cake. But honestly? The same was true for my extract. I just couldn’t taste any vanilla in my baked goods at all. Which is probably not very surprising since for most recipes you use one teaspoon of extract. Which is not very much, if you ask me. Or maybe it was my home-made extract? Maybe I was doing something wrong? So I finally invested in a bottle of store-bought extract. It was stronger than my own, but basically there wasn’t any difference in my finished baking products. I just didn’t taste anything. Maybe I just was expecting too much of that little and expensive bottle of extract? Maybe my taste buds are crap? It’s probably a bit of both. My expectations were very high because vanilla extract is such an essential and typical ingredient in Northern American baking recipes. In my experience we Germans don’t use vanilla that fervently. Sure, vanilla sugar is called for very often, but many recipes also come without it, I think. Maybe it’s more a matter of personal preference. Some people use it in every recipe, others don’t. At least that’s my experience. 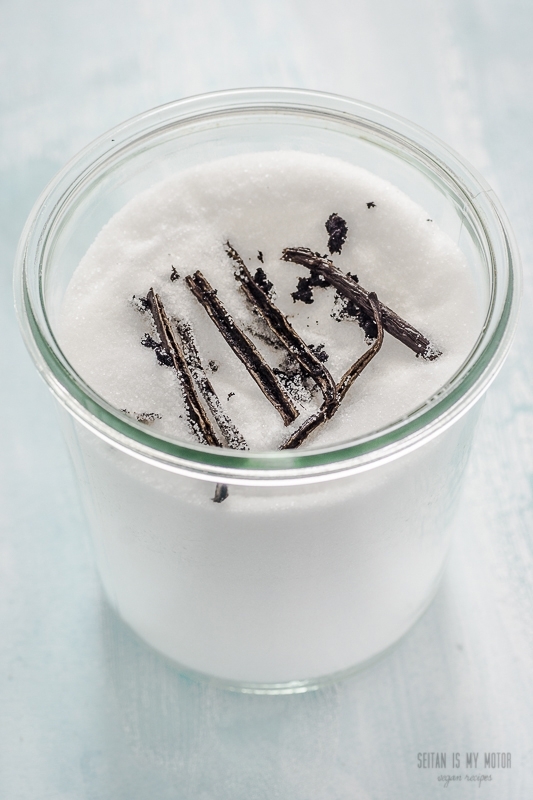 German vanilla sugar comes in two varieties, too. We also have those packages flavoured with imitation vanilla and those made with bourbon vanilla. I grew up on the imitation vanilla stuff. If you taste both of those sugars straight from the package there is a big difference between them. 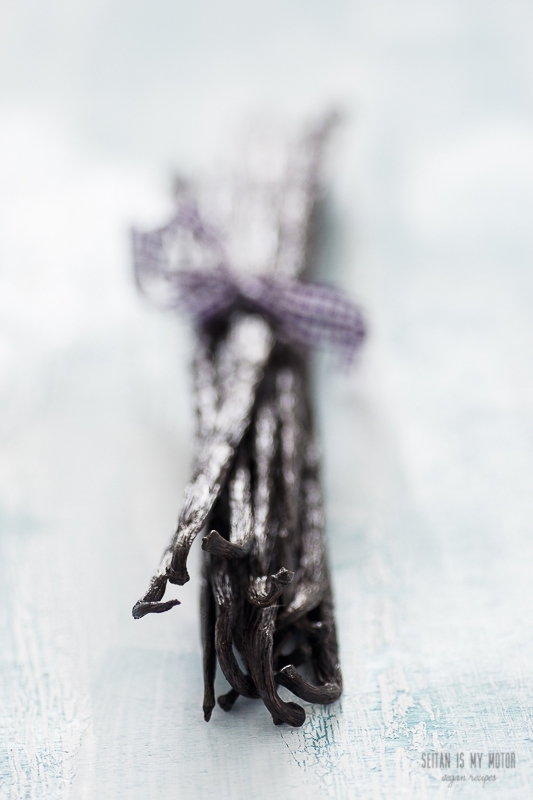 The real vanilla adds a complex flavour to the sugar which is similar to that of vanilla. The artificial stuff is different. And I cannot even describe it properly. It’s just flat and sweet artificial vanilla. You probably know what I mean. In a baked cake both don’t make much of a difference, if you ask me. It’s exactly like that Cook’s Illustrated test result for vanilla extract, I think. I stopped using imitation vanilla years ago. Not because I am afraid of the flavouring’s origin. I simply think it is a waste of money. Why would you buy that stuff if you cannot even taste it? And if it’s not even close to real vanilla? Maybe my taste buds are lazy or numb, but if I want something to taste like vanilla, I use vanilla. Lots of it. For me even bourbon vanilla sugar won’t do. I prefer pods. I still add a teaspoon of vanilla extract to most of my recipes even if I am not convinced that it contributes anything to the flavour of my baked goods. Because so many people like it. I mean, I might be overlooking something? Better safe than sorry? So when my last order of vanilla beans arrived and my home-made vanilla extract was almost gone, I was about to make a new batch. But because all of those things discussed above I didn’t feel very motivated to fill my jar with vodka and vanilla pods again. It takes so much vanilla and so much patience for so little flavour! So I changed my mind. How about home-made vanilla sugar instead? I imagined this would be faster and still serve the same purpose as an extract: a flavour booster used on a daily basis. I sliced and scraped out two vanilla pods and started to mix them with 400 g (2 cups) of granulated sugar. And that didn’t work. The vanilla did clump and mixing was not really possible. If I had researched “home-made vanilla sugar” before starting my experiment I would have found out that the process to make it is almost the same as the one for home-made extract. You need patience. And time. Because you are supposed to stick the pods into the sugar and then let the jar sit for weeks or months before you can use that sugar. Well. I am not a very patient person when it comes to things like this. I wanted my jar of vanilla sugar now. So I dumped the mixture into my high speed blender and pulverised it. Now, if anybody tells you impatience is not a good character trait, this time they are wrong. Impatience can be part of a creative process and it can foster a good idea. At least when you want to make an amazing vanilla sugar. One that finally answers your expectations. One that really displays the complex vanilla flavour in all its facets. You can use it in little quantities just like you would use commercial vanilla sugar or vanilla extract (about 20 grams equal a package of vanilla sugar) or you can use it to make a really stellar vanilla flavoured dessert. For example I used it in a white cake and replaced 1/3 of the sugar called for (by weight) with this vanilla sugar. And I was surprised by the fantastic and outstandingly strong vanilla flavour present in every slice of this cake. But see (and taste) for yourself. I bet you have lots of recipes to experiment with. I would love to hear what you think! Note: If you use fresh vanilla pods, the sugar will probably clump. So make sure to sift the sugar once you use it. I’ve been striking out with my homemade vanilla, too. The commercial vanillas I bought in the US were more potent, and the little vials of liquid vanilla available here in Germany taste just awful to me. Your vanilla sugar sounds worlds better than the little packets I’ve been buying. Thank you! Yes those vials are pure artificial vanilla and they are terrible! Hmm, if vanilla sugar has a much more obvious vanilla flavor then the extract, I’m definitely going to have to try it! What a great idea–I have to try this out! I usually end up tripling the amount of vanilla extract when I bake things. Maybe my taste buds are just maturing (getting old? ), but I find a lot of recipes to be too heavy on the sugar, and too light on the other flavors. I’ve also really come to appreciate the subtle complexity of a vanilla dessert. Yes, that is true! I love simple vanilla desserts, too. Whoa! You blend the pods?? I’m always bummed at the amount of seeds I assume get left in the pod after I scrape so I love the idea of pulverizing the entire vanilla pod. No wonder it came out great. You get every bit of vanilla in there! I stopped using vanilla extract in my baked goods a while ago. Like you, I just didn’t taste it unless I was making something with a strong vanilla flavor. This is genius! I’ve never even heard of vanilla sugar, but I agree that vanilla extract doesn’t add much flavor as I’d like. I like LOTS of vanilla! I’ve had extracts that were better than others. But still, I want more! I’ll have to try making vanilla sugar in a blender! I also agree that the vanilla taste is never prominent enough in baked goods. In chocolate chip cookies, though, I cannot do without the vanilla extract… With that said, I have taken to adding some to baked goods, and I swear I get the strong vanilla flavor I hoped for whenever I add it. I’m going to try it in pudding. I have wanted forever to make my own extract and sugar, so thank you for the cautionary story and the recipe! I’ll share what happens when I’m done. 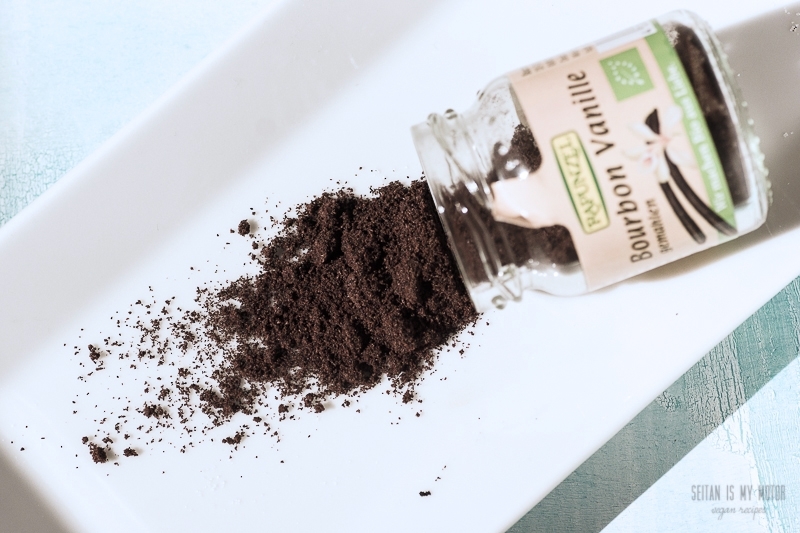 I meant to say that I’ve taken to adding the linked Madagascar Bourbon Vanilla Powder… works like a charm! Sorry, I’m a commenting mess. Thank you for the tip, Jessica! I don’t think I have access to that but the ground vanilla pictured above is available here and also pretty good. This is such an awesome kitchen hack! I see some crème brûlée in my future. Mmmm that sounds like a great idea. I’ve only ever made vanilla sugar by leaving the pods in sugar for a long time. I bet this tastes better…now you don’t feel like sharing your white cake recipe do you? I’ve been looking for a decent plain, light cake recipe for a while! Thanks for your other great recipes by the way. Not yet. It was good flavour wise, but too dense. Well I’m buying vanilla pods tomorrow and I’m going to have a go at making brown vanilla sugar because I don’t generally buy the white stuff (trying to convince myself that it’s health food ;-) So I await your cake experiment with baited breath, though I suspect the “dense” cake was pretty damned good. Wow, das ist eine tolle Idee. Das muss ich ausprobieren. Zur Zeit benutze ich immer frische gemahlene Vanille aber wenn sie ausgeht wollte ich nicht wieder auf gekaufen Vanillezucker umsatteln..